Has anyone tried to install more serious ama's on a Pro Angler 14? I'm considering a 3.3 square meter sail from Star sails in Australia. They have a USA distributor. 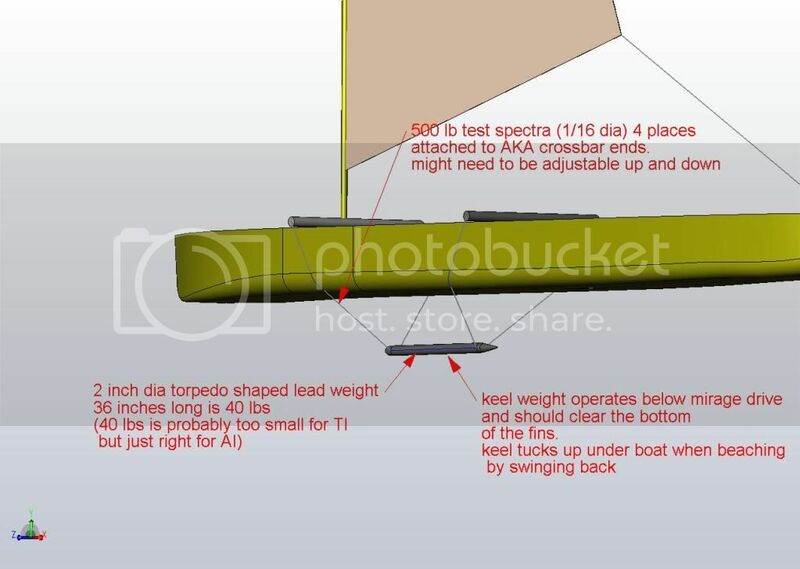 Complete mast, furling and sail with all running rigging for $475. But those tiny inflatable ama's seem pretty wimpy to me. Anything more substantial been tried? The PA is pretty beamy. You might not need any amas if you sail conservatively and figure out a way to sit on the gunwales. Without much in the way of a center/dagger board, you're only going to do so much with a sail on the PA anyway. And with a larger center/dagger board, you'll get less slip and more heel, which it appears you do not want. The PA can be sailed, but it's not really a sailboat in the way that the AI and TI are. Putting larger amas on it won't make it one. I don't care if it's not considered much of a sailboat. I'd get a sailboat if that was my object. I want a way of going longer distances without fatigue. You're skeg might counteract some of the leeward slip, so make sure you deploy the skeg while sailing, specially upwind and beam reaches. If the keg is behind the sail then you're going to wind up with lee helm which is rarely a good thing. My point here is that sticking a sail on something does not necessarily buy you anything. I have sailed the PA with the hobie kit sail and it does okay, sort of. I don't know anything about the sail the poster mentioned here. It might be better, or not. Either way, the PA can definitely be sailed, but I didn't find it to be something I'd want to do with it over longer distances. We have done a lot of kayak sailing on all of our Hobies (many different models), however not on the PA 14. Actually all 8 hobies we have bought, we purchased the sailing kit along with every single boat, and have never taken a Hobie kayak out on to the water without a Hobie kayak sail strapped to the side of the boat (not even once), to us it's just part of the boat. I just looked at the website for that 3.3 square meter sail from Star sails in Australia. Boy do I wish that had been available a few yrs ago. That much sail on a revo 13 might be a little scary without the training wheels (Hobie side kicks kit). We used to run the Hobie kayak sail which I think is around 1.9 sq meter (smallish), we also ran a combination jib/spinnaker. But boy was it touchy, we could only use the big sail in really light steady air, and mostly downwind. You still get wet a lot (capsize, which is all part of kayak sailing). On our bigger boat which was an Oasis the 1.9 meter hobie kayak sail was woefully to small, as I would suspect to be the same with the PA 14. The PA 14 is way more stable than an Oasis or a Revo, the problem with both of those is they flip so fast it makes your head swim (literally lol). I suspect on the PA 14 you will have a little more warning, and like Tom said possibly lean out on the gunwale if you have to. I definitely would not get the training wheels (Sidekicks), at least not right away. I would definitely try the 3.3 meter sail out without any AMA's first and see how it goes. With a furlable sail you can always run it partially furled in heavier winds (just like we do on the Islands). Your Mirage drive fins pointed down should be sufficient as a dagger board for most occasions, yea you will get a little slide slip, but you should still be able to climb upwind just fine, and if you pedal at the same time it's even better. On Hobies, the Mirage drives and the sail work in combo. It's best to not pretend your a dang sunfish, if you want to sail that way get yourself a sunfish. Totally different universes. Just PVC caps on the end are fine, nothing fancy, it's a torpedo shape, which is the most efficient shape underwater, and creates almost no drag (small diameter/longer = better). I just let mine find it's own way when I pull on the beach, it's not like you can possibly hurt it. The Spectra string is incredibly strong, and all you should need. Here is a pic of me sitting on the rail of our TI with a keel weight under the boat. Shouldn't take a lot of weight to lower the center of gravity (that's basically what you are going). One problem that will likely occur is the mast pocket on the Hobie kayaks is only strong enough to support the 1.9 sqm kayak sail. It will likely fail with a larger sail. What I always do is re-enforce the mast holder on all my Hobie kayaks. I don't own a PA 14 so I don't know what it looks like inside, (you are on your own here, but the same concept should work) It's super easy to do and requires no skill. and there are a couple options basic, and advanced. Basic: Just get access to the inside of the hull and look at the mast holder mount (on most Hobies you can see it from the front hatch). What I do is just clean the area around the bottom of the hull where the mast base is with denatured alcohol, or if you can get it (rubber glue remover, which is Heptane (heptane melts Polyethylene (what your hull is made from)). then just spray a light coat of Krylon for plastics spray clear coat around the area (very light coat). Now just get some GE silicone out of a calk gun and bury the bottom in a pool of silicone, Doesn't have to be super thick, but the larger diameter you have the better (more surface area). If you want to get fancy you can flip the boat over and do the same to the inside top surface inside the hull. Advanced: If you take a PVC cutting board (or any plastic), make about a 4-5" dia disk with a hole in the center (big enough to fit around the mast base), now cut that disk in half (so you can install it), then just gob a bunch of silicone over the area (just like above), then just squeeze the disk onto the top while it's still wet. ( you can now tow your car with your mast if you so desire (lol)). I only use silicone because if you ever sell the boat you can always just peel it away and remove it, (though it takes a while to peel out of there). Oh one more thing, On all of our 7/8" dia aluminum masts, if we didn't shove a fiberglass pultrusion up into the bottom of the mast a couple feet, they bent too easily (maximum point of stress it just above the mast holder). A set of swing down Lee boards would be awesome! Even if not exactly at sails center of effort. One of the videos from star sails shows him deploying the Lee boards and what a difference they make! Those add on center boards are really only for non hobie kayaks ( without the mirage drive). You simply don't need a centerboard at all on a hobie (any model). With all of our Hobie kayaks when we bought the kayak, we also bought the sail kit, the bug turbo fins, and the big sailing rudder when we bought each boat new (most dealers give good discounts on all the acessories if you buy them with the boat, so we always bought everything we could think of with the boat,(ie...anchors, seat pads, PFD's, leashes, dry bags, night lights, scupper carts, trampolines (on Islands), roof racks, etc). We figure your gonna get all that stuff anyway. Of course you can't put the big twist and stow sailing rudder on a pa, hopefully another PA owner on here with a sail kit will let you know how it works with the standard pa rudder. I suspect all you will need is the sail kit and turbo fins and your good to go. I would definately either make up your own pvc furler, or buy the hobie furler kit. 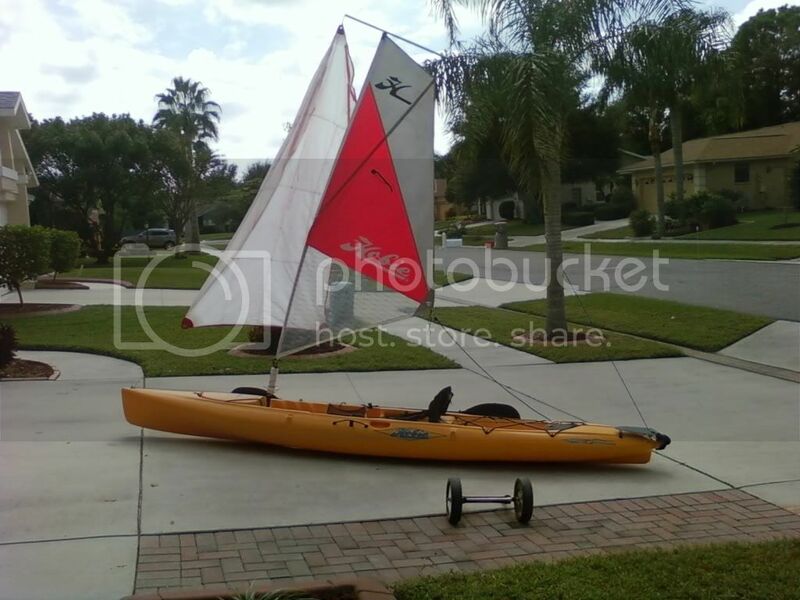 Just a thought if you haven't kayak sailed or sailed at all before, you might want to start with the hobie kayak sail, then later move up to something bigger if you feel the need. Keep in mind all Hobie kayaks are unique, Every Hobie Mirage kayak made is designed from the ground up as a fully functional sail boat (because everyone at Hobie are full blown sailers). You only need to purchase the optional sail kit and your good to go. All hobies are also designed from the ground up around the mirage drive system. Everything was carefully designed to work together, specifically all are perfectly capable of upwind sailing. Downwind only sails, and not designed for upwind sailing at all. Hope all this helps you make decisions. Those add on center boards are really only for non hobie kayaks ( without the mirage drive). You simply don't need a centerboard at all on a hobie (any model). Some very good points, but with some exceptions. As you may know, the Revo 16 (former Adventure) has had a daggerboard slot and an optional Hobie daggerboard for the last 11 years (before the AI ever came out). Those of us who sail the Revo 16 feel that the daggerboard enhances the the Mirage Drive significantly, both in tracking and stability. So the notion of a lee board isn't as superfluous as it may seem. Results remain to be seen. Actually the standard PA rudder is the only one I've ever used and it works great. It's the one used in the picture. Of course, other opinions are always welcome! Keep in mind all Hobie kayaks are unique, Every Hobie Mirage kayak made is designed from the ground up as a fully functional sail boat (because everyone at Hobie are full blown sailers). Keep in mind that the Hobie kayak sailing kit uses a one size fits all sail (excluding, of course the AI and TI). Performance varies significantly with application, depending on boat length, width and weight. In my experience, the Revo 11 is quite tender with this sail, whereas the tandems, inflatables and PAs are very stable with the sail, but tend to have comparatively sluggish performance. Regardless, the Hobie sailing kit is a great place to start, very simple to use and quite adaptable, especially with the furling kit as you mention and Sidekick as necesary or desired. I totally agree that all the Hobie MD boats are uniquely designed to perform with the Mirage Drive (as opposed to a paddle) and the Drive does an outstanding job of adapting to the users and boats, despite size and speed range variations. All good points, in our experience we had a couple revo 13's and an Oasis. With me solo on the Oasis and my wife on the Revo13 I couldn't begin to keep up with her kayak sailing with the standard Hobie kayak sail (one size fits all) However tandem on the oasis with two people peddling we were on fairly equal footing as long as both the occupants keep peddling lightly while sailing. When we first started out we only had the one revo, and an Oasis. Later on we ended up getting a second Revo 13 for when just me and the wife went out. We reserved the Oasis for when we had more people along. Then the problem became hauling 3 kayaks on the roof of our Yukon Denali. In 2010 we traded the Oasis in for a TI, which ended up being our go to boat that could carry up to 4 people, (obviously a little over loaded with 4). We kinda stopped using the revo's so after a couple years sitting in the garage I sold them (with regrets), I loved those boats, and kayak sailing, but as mostly divers (what we like to do most), we needed something that could haul more gear (scuba tanks) and we could take further out offshore and greater distance (mostly off key west), so that's how we have our TI rigged and modified slightly (for offshore). We still do a little river kayaking with the TI in kayak mode, but anymore we are mostly offshore. The thing we like about the TI is we can still do both with one boat. We don't fish at all (except spear fishing), so we never got into the PA lineup, and anymore are mostly just salt water people. If we ever move back up north inland my first purchase will be a couple new Revo 13's with sail kits. Thats our story and were sticking to it. We love our Hobies. 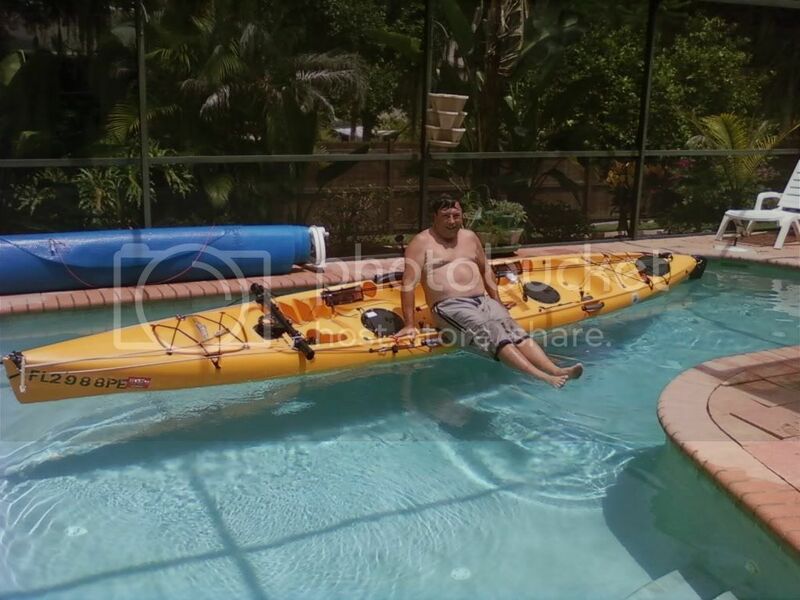 I'm looking at this expandacraft outrigger one so I can use my old Honda 2.3. Maybe an option if you like to add a sail. Ok Ricky, now you got me thinking...why bother with a sail? Did you have to engineer your own mounting system? Do you feel a need for a second ama on the other side, or does the added weight on the motor and pontoon offer adequate stability? I'm really interested in the details...what size, etc..